Please visit us at nyvagrecords.tumblr.com for updates. It's finally available! 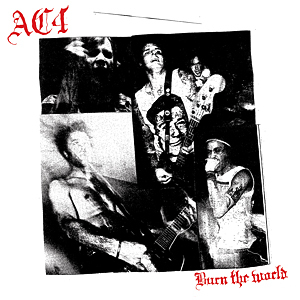 The new album Burn the World from AC4. LP or CD 100 SEK/10€. Burn the World is slightly delayed, but should be available any day now! The new AC4 album Burn the World is to be released March 18 in cooperation with deathwishinc.com. There are a couple more exciting releases planned for 2013. Details soon. Orders will not be processed between June 5 and the 14th. And it is now out of stock. Invasionen - Saker Som Jag Sagt Till Natten LP is back in stock! Alonzo & Fas 3 - Dansa Som En Fjäril 7''. on Ny Våg Records: Alonzo & Fas 3 - Dansa Som En Fjäril 7''. We start the new year with a sale on all of our CD:s. Check the shop for availability.